I actually got the idea from an old site called Java on the Brain, which has a bunch of Java applet games. My original goal was to rewrite them in miniSphere since applets no longer work in most, if not all modern browsers. They still work in Netscape 7.2 (which still installs in Windows 10, oddly enough) but nothing on the internet lasts forever. 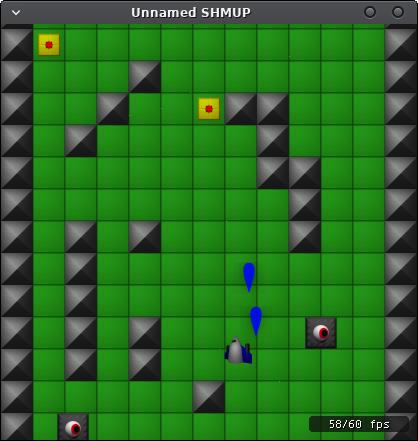 "Unnamed "SMUP" is based on Warp/Warp 1.5 from JotB. I got the idea for doing the graphics in Blender from Warp 1.5's History page, which mentions doing the graphics in POV-Ray. I've never used it, but I am plenty familiar with Blender. I say "My original goal" because for copyright reasons I may end up using the same gameplay but with my own graphics and sound. I'll still probably end up distributing them as a package with their own game menu. I still find this excerpt from the Wap 1.5 page kind of funny. "MIDI music in particular tends to hog a lot of processor capacity." As usual, technology marches on. Oh oops, that penguine.rss is just for testing. I thought I removed it but apparently I forgot. Or maybe I did but I didn't push that change to the repo yet. You can just put your favorite spriteset in the same directory as the executable, run it, and it should work. I've been working on my old shoot 'em up project for the last couple days, and I'm kind of surprised how well replacing the old sprites and tiles with ones rendered in Blender has been going. Wow, I haven't updated this thread in a while. 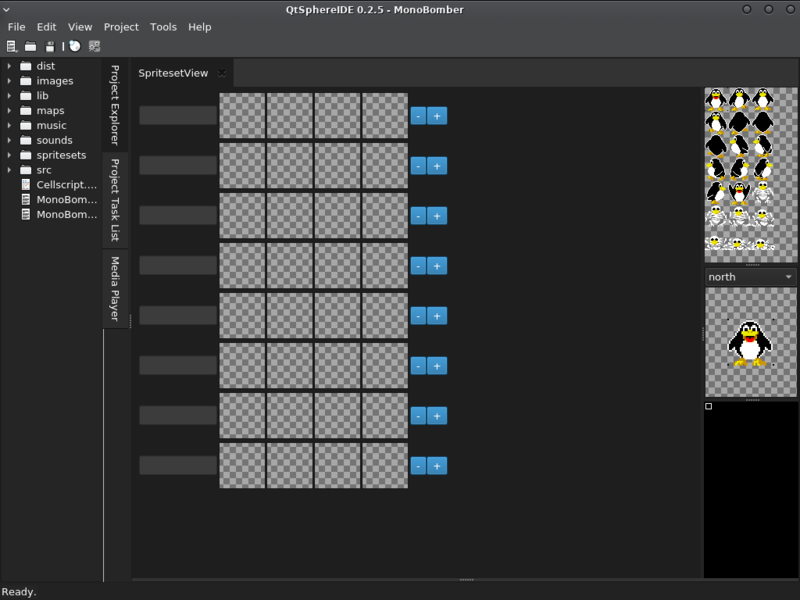 But QtSphere IDE is still under heavy development. I thought I posted this already, but apparently not. While it's a little buggy still (dropdowns act strangely with a QSS theme), QSI has a decent looking dark theme! So, I got the MapEngine to work with the simple template method; I was even able to change walking speeds and utilize the zoom aspect. But when I use the code for the more 'dynamic' version, I'm running into a few problems. There are no errors called and the game loads up fines, but the map isn't drawn correctly and none of the input works. I created a new project, copy-pasted the code, adjusted for custom map and sprite, and still got the same result. I'll post some pics and a link to the smaller project I made. Well, it's not just a matter of renaming the file, for the record - the file extension is just a hint to programs. You actually need to convert the .rmp map to the .mem format, which is what the included Cellscript does. Same deal with the spritesets. That was absolutely it. I didn't have my map's file extension as .mem. I guess I overlooked the fact of having to change it. Same with my sprites, also; had to change them to .ses. I figured it was something simple. Bleh. Thanks for the quick response!